1. Preheat the oven to 180˚C, gas mark 4. Place the fish skin-side down on a baking sheet lined with greaseproof paper. Mix 1 tbsp olive oil with the Cajun seasoning and brush over the top of the fi sh. Roast for 5 - 6 minutes. 2. Meanwhile, mix the sweetcorn, avocado, tomatoes, red onion, lime zest, chilli and the remaining oil in a bowl. Season and toss with most of the coriander. 3. Mix the soured cream with the remaining coriander and lime juice. 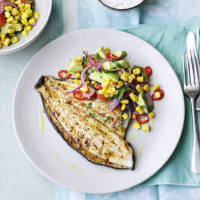 Serve the fish with the sweetcorn salad and the herby soured cream.